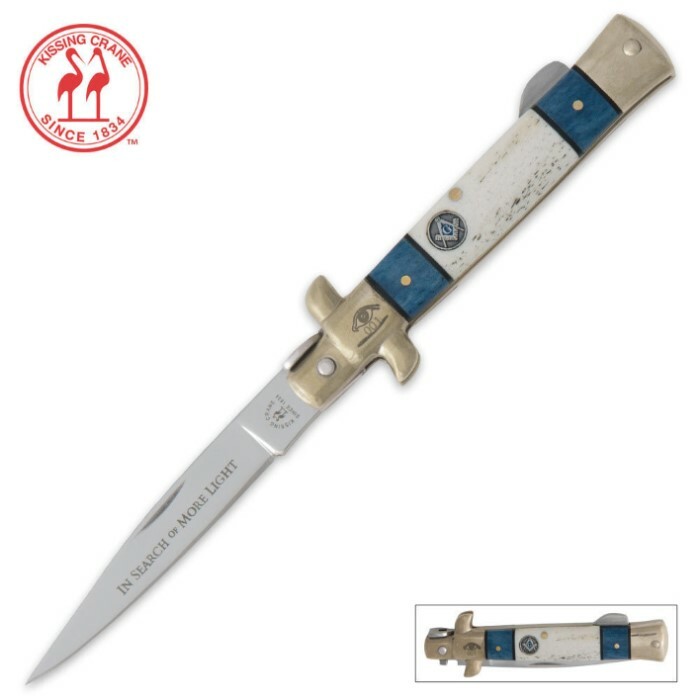 Kissing Crane Special Limited Edition Masonic Stiletto | BUDK.com - Knives & Swords At The Lowest Prices! Experience the unrivaled quality of Kissing Crane® knives with this Special Limited Masonic Collector's Edition stiletto available for only a short time. Each of these hand-crafted collectibles features dyed bone handles with an inlaid Masonic emblem. ARTFULLY DONE - MASONIC BROTHERS - JOIN ME OR JUST JOIN IN! WHAT AN ARTFULLY DONE KNIFE FORN MEMBERS OR NON-MEMBERS! THE ATTENTION TO DETAIL CAN BE SEEN BEFORE ACTUALLY EXTENDING THE BLADE. THE HANDEL AND BOLSTER WORK ARE BEAUTIFULL! WITH THE SEQUENCE NUMBER ETCHED ON THE KNIFE THAT IS A MUST ADD ITEM. This knife is not only a beautiful piece of workmanship, it is a convenient and practical pocket knife. It looks and is sharp in all definitions of the word and is a handsome symbol of membership in the fraternity. I would recommend it as a gift to newly raised brothers or anyone's favorite mason.